This picture and that below this paragraph were both taken from more or less the same position and more or less the same time. 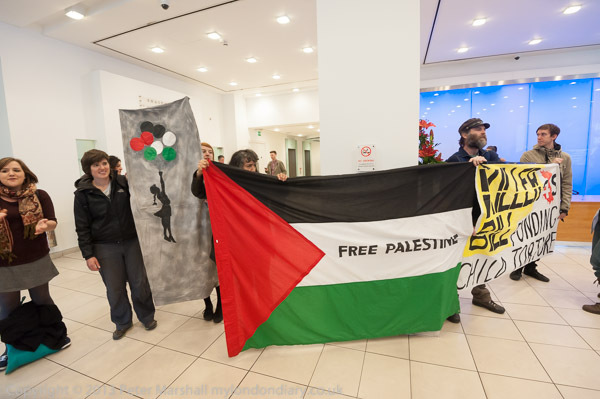 As you can see, I’ve moved just a little to my right in to taken the lower image, hiding the lower part of the Banksy image behind the Palestinian flag. Both are images take with a lens of focal length 16mm on full-frame sensors. The upper image was made with the 16-35mm on the D700 and the lower with the 16mm Nikon full-frame fisheye. The most obvious difference is the much wider angle of view both horizontally and vertically in the lower image. The difference in perspective is very marked, particularly in the floor tile and in the ceiling, but much less so in the central strip where the people and the banners are. The differences between the two images would be rather greater if I had not used the Fisheye-Hemi plug-in for Photoshop on the lower image, transforming it to cylindrical perspective. In the original fisheye image those hefty square pillars were curved, but here the verticals remain straight. The plug-in also makes the centre of the lower image jump out a little less; straight from the camera it would have been more dominant, and objects close to the edges, such as the man on the left such as the figures at either edge would have been noticeably thin and curved. You also lose a little at each corner of the image and have to allow for this in framing our images. Somehow looking though the viewfinder these corner parts that are lost aren’t very important, perhaps because of the their smaller scale and curvature. I don’t like to use the word ‘distortion’ about them; it isn’t really a distortion, just a different perspective. The fisheye in fact seems to have very little distortion, and the rectilinear lens rather more. Some time back I decided that for the kind of subject matter I more often photograph a little distortion is seldom a problem, and changed the default profile Lightroom uses with images from the 16-35mm so as not to bother to correct it. It shows up in the upper image, particular in the lines in the floor which have a slight curve. If I had thought about it when I was processing these images in Lightroom I would have corrected this by turning the distortion setting on the profile tab for Lens corrections back to 100% for these rectilinear images. Then those lines would have been truly straight. Lightroom’s default for the 16mm is also to try and straighten these curves for the lower image, forcing it into rectilinear perspective but this just does not work. The image just gets too stretched and blurred towards the corners – where there just aren’t enough pixels to work with. You can use this and crop the image to remove the soft edges, but you end up with an image that could have been taken with the 16mm rectilinear lens (or perhaps just a little wider.) If you don’t use very wide angles very often and your widest other lens was something like a 21mm or a 24mm it might be more useful to supplement this with the semi-fisheye 16mm (or its equivalent on the DX format, the 10.5mm) especially if you use a D800 which has plenty of pixels to spare. Then you would have the really extreme (180 degree diagonal angle of view and around 147 degrees horizontal) fisheye or, after cropping the equivalent of something like a 12-20mm digital zoom in a very small and light and relatively cheap package. With 32Mp to play with you can crop quite a lot and still end up with a decent size hi-res image. The same kind of think is also possible at the long end. At times I leave the 70-300mm at home knowing that in an emergency I can crop the 16Mp DX image I get from the 18-105mm DX lens and crop the images from that to give myself the equivalent of the 300mm with enough pixels for almost all purposes. 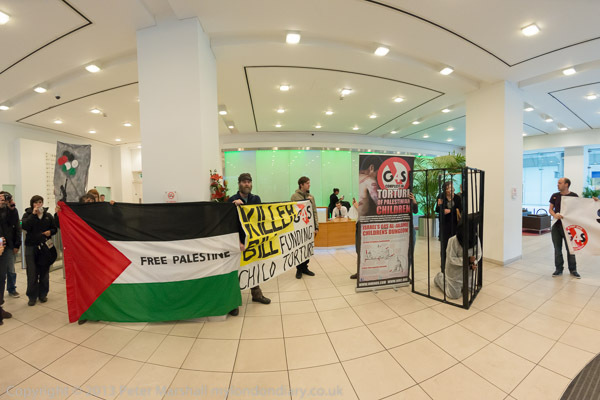 The occasion for a whole series of six truly ultrawide images was when a protest outside the G4S offices in Victoria St against the services they provide for Israeli prisons where Palestinians are locked up, often without charge or trial and many are tortured decided to move inside into the office foyer. Most of the images were made with the 16-35mm, but there is a series of half a dozen starting with the one above that were made with the fish-eye. Here is another. It’s obvious when you look at it and think about it, but I don’t think most people would notice. And it is the pictures that don’t immediately make you think ‘fisheye’ (or anything else about how they were made) but get you looking at and thinking about the subject matter than I think are successful. 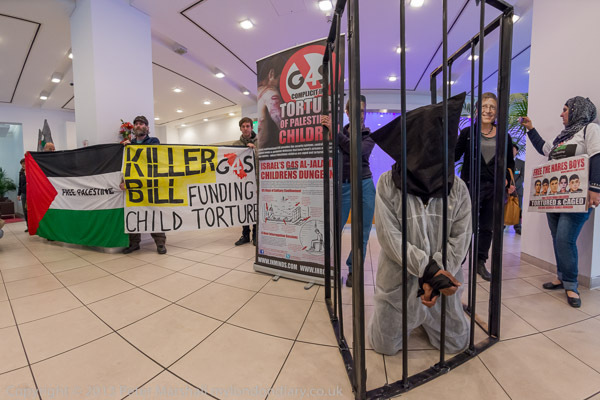 More pictures (and text) at G4S Occupied on Palestinian Prisoners Day. This entry was posted on Saturday, May 24th, 2014 at 09:41 pm and is filed under My Own Work, Photo Issues, Reviews etc, Technical. You can follow any responses to this entry through the RSS 2.0 feed. You can leave a response, or trackback from your own site.